Video editing has a notorious learning curve and is generally not very beginner-friendly. If you’ve tried to use an editor in the past, you may have been put off by how complicated it was. That won’t be the case with Movavi Video Editor, as it was developed specifically to provide a more user-friendly alternative without any learning curve to speak of. 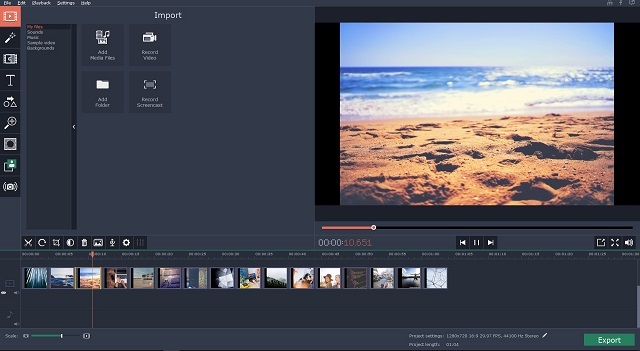 Overall the user experience of Movavi Video Editor is smooth and intuitive. Its interface is timeline-based and has a clean design that uses icons and tabs to organize its tools and features. Because of this approach, it is easy to navigate and find what you are looking for. Similarly, Movavi Video Editor has engineered each tool and feature to try to make it as intuitive as possible. To do that it leverages actions that are common and familiar, such as dragging and dropping elements, adjusting sliders, resizing frames, and so on. Suffice to say it won’t take long for you to familiarize yourself with Movavi Video Editor’s interface or features – and it should be a smooth and painless experience. Regardless of whether you’re a beginner or more experienced user you should be able to acclimatize yourself with the editor quickly. Split videos into segments to isolate and trim out any unwanted parts. Merge video clips and arrange them in the order that is required. Enhance the video quality manually or automatically and fix other issues that may be present. Add audio tracks to videos to include background music or a voiceover. Edit audio tracks to improve the sound quality, adjust audio levels, or apply audio effects. Apply artistic filters to give the video a unique visual style. Utilize special effects such as Chroma Key, fast forward, split screen, and more. Insert customizable text elements as captions, titles, or subtitles, including some in animated styles. As you can see you’ll have a lot of powerful options that you can choose from to edit your videos. To sum it up Movavi Video Editor does live up to its aim of providing a more user-friendly and intuitive option to edit videos. At the same time, it does not scale back on features to do so and remains a potent video editor. If you’re looking for a way to start to compile, improve and create video content – you can’t go wrong by trying it out. Even more, experienced users will probably find its simple and streamlined approach to be a breath of fresh air and it will allow them to make the changes that they want more quickly and effectively.